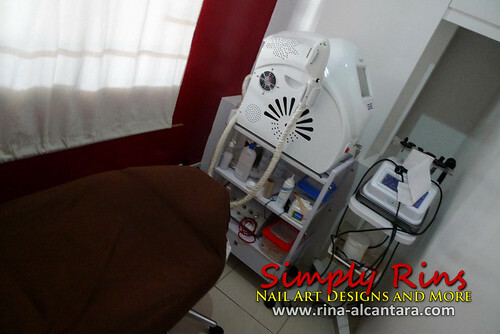 Last April 2011, I decided to avail of an IPL (Intense Pulse Light) underarm hair removal treatment from S-Bar Spa and Skin Center. I have been meaning to undergo the treatment but it requires at least 6 sessions for maximum results and the price is quite expensive for me. Fortunately, I was able to buy a good deal from a group buying site. At the time of purchase, I was able to purchase 6 vouchers from Ensogo for only Php600 ($14) each. That was 80% off the original cost. Each session was scheduled 3 weeks apart. I completed my 6th treatment earlier this month and I am a satisfied client. The underarm is one of the areas of our body that is highly sensitive to skin discoloration. Procedures such as plucking, shaving, and waxing to remove unwanted underarm hair contributes to darkening. And since removing underarm hair is inevitable among girls, not worrying about it would definitely make life easier. Underarm hair also contributes to body odor. Undergoing a hair removal treatment can almost eliminate this problem. No more razor bumps caused by shaving. No more monthly expense for waxing. Although hair growth may still occur after finishing your IPL underarm hair removal treatment, hairs will be finer and almost unnoticeable. NO plucking or waxing of underarm hairs at least a week prior to procedure. Shaving is acceptable as long as there's minimal hair growth visible on the day of treatment. Other hair removal procedures have a further delay on hair growth. The use of any whitening product is strictly NOT allowed at least a week before the IPL underarm hair removal session. Beauty regimens such as scrubbing, bleaching, and peeling is also NOT allowed. Do NOT use deodorant or anti-perspirant on the day of the treatment. Apply the post laser cream once in the evening and once in the morning for 5 consecutive days. Applying a deodorant or anti-perspirant is allowed as long as you allow the post laser cream to be completely absorbed by the skin before applying anything else. Waxing is allowed after the 3rd day of treatment but it would be last time prior to the next session. Shaving is allowed on the 3rd day after the procedure. NO shaving is allowed a least a week prior to the next treatment. The procedure will take approximately 10 minutes or less per session. It takes longer after the 4th treatment as there is almost no hair growth visible. This means, the doctor needs to make sure the IPL hits all the hair follicles by repeatedly moving across the underarm in various angles. There is a slight sting every light emission but very tolerable. An ant bite is much painful. Is it necessary to complete 6 sessions? According to the doctor, 6 sessions is the minimum number of treatments to achieve best results. Some clients may require more than 6 sessions depending on the hair growth cycle. Consult with your doctor if you will be needing more than 6. Is IPL same as laser? No. A laser hair removal treatment is different from an IPL hair removal procedure. The former uses one beam of light while the latter uses several light wavelengths, making it more effective and causes less skin damage. This is one procedure that I don't regret. Thanks to group buying sites that made it all possible for me to afford the treatment. I am now virtually hair free. I don't have to worry about unwanted underarm hair and it will save me trips to a waxing salon. But most of all, thank you to S-Bar Spa and Skin Center for an excellent service and for being accommodating to all my questions. I want to try this too but im still too scared! But good job on bagging those coupons! How much is it's regular cost in S-Bar Spa and Skin Center? thanks! Hi, I wish I could address you properly with a name. The time I purchased the vouchers, the regular price of the IPL Underarm Hair Removal treatment was Php3000. Please contact them directly at (02) 577-1973 just to make sure. Thanks! Hi, the results of the IPL varies per person. As for me, I used to have a very hairy armpit. After 6 sessions of IPL treatment, I was very happy with the results. There were occasional hair growth after a few months BUT almost unnoticeable. My sister had minimal hair growth after a few months of her 4th session from another clinic. She decided to complete the minimum of 6 sessions by getting 2 more from where I had my IPL and so far, she's happy with the results too. My doctor said that it is possible to experience minimum (as in) hair growth after the 6th session. You can get another one to completely remove everything. Remember that IPL treatments depends on your hair growth cycle, that is why at least 6 sessions is necessary. Hi, is it true that ILP treatment can cause skin (in your case) underarm darkening? I think it is best to consult your dermatologist about your concern. As far as I know, it would improve the condition of your underarm skin. If it would whiten your underarm, it will lighten because hair follicles under the skin will be removed. But that is quite different from whitening. How many sessions have you undergone? I can't vouch for other companies that offers IPL procedures except for the one I got mine from. Did you read all my articles on IPL? I have detailed account of my experience that answers your concerns. Hair on the knuckles will be terribly troublesome to shave or wax. Plus, the chaff that seems because the hair mature back simply appearance weird to whoever notices it, for more information click here moroccan bath. great method of permanent hair removal, but I not sure if it will have any other symptoms in the future. unlike epilator hair removal & shaving method which is safer to use.